I received an advertisement by post encouraging me to vote Mike Rawlings for Dallas Mayor. Four pages, folded, full bleed color, card stock - very well printed. Too bad that the content is sloppily written and poorly reasoned. Maybe the people of Dallas are stupid. It got a bit wrinkled from being stuffed into a fanny pack and transported by bicycle. I've pasted much of it below with comments. I don't have children and I don't accept responsibility for educating the children of others, much to their relief. My parents were both teachers, and my son will start teaching next year, so for me, education is personal. I'm happy for your parents, not quite so thrilled for your son. THE CITY COUNCIL SHOULD STAY OUT OF IT. It changed my life, and it can change the lives of so many of our Dallas families if we can just get it right. "Just get it right"? You don't sound very confident. "Ay, there's the rub." You won't get it right... but don't feel bad... you cannot get it right. You're making yourself a volunteer, an un-asked for volunteer. The education industry is not the responsibility of the Mayor. If you want Hinojosa's job, apply for it. Some people think that reducing crime will grow our city. Well, our crime has gone down over the past few years Kunkle agrees and people are still moving to the suburbs. I think they are leaving for better schools. Our parents shouldn’t be forced to choose between sending their children to an academically unacceptable school or moving to the suburbs. Agreed, Mr. Rawlings, which is why you should allow (how sad that we must beg) parents to educate their children, not the government. I doubt you'll ever go logically forward with your own statement. Fact is, we cannot be a great city without great public schools, You know this isn't true, even more so than I and stronger schools will build stronger neighborhoods. That’s why, as Mayor, I will implement a comprehensive and sustainable plan to help improve our public schools. We must be accountable as leaders, and as a community, for helping educate our schoolchildren – because it’s an issue that touches us all. I thought you wanted to be Mayor of Dallas? Oh, I see, your method of getting elected is a straw man - promote solutions to issues over which you have no authority. It's certainly easier than tackling a problem head on. Wait, maybe I'm not seeing through you as well as I thought. Do you plan to Obama DISD ? ?, to just run it without mandate or authority of any kind? Keeping reading, kids. The only way to fix the school system is to remove government from the school system. Injecting yourself into the mix as Mayor will not work. We'll wait and see. Let's come back later and see if the graduates of DISD's 2021 high schools are better educated than the graduates of DISD's 2011 high schools. 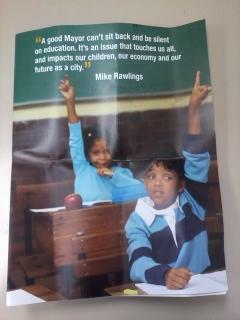 A sustainable plan to help public schools. As Mayor, Mike will create an Urban Mayors Task Force, calling on the Mayors of Dallas, Fort Worth, Houston and San Antonio to lobby Washington and Austin for public government school funding in our urban areas that need help the most. Why not call on the Mayors of Mesquite, Flower Mound, Venus and Melissa? Because Big Mayors demand big money. "Throw more money at the problem and we'll solve it." Where does that money comes from? Who are you asking to fund Dallas schools? These people. Is this the way you ran Pizza Hut? These areas represent more than 50% of the state’s population, and already use their collective firepower interesting metaphor to lobby for critical transportation dollars – we should be doing the same for our schools. These transportation dollars of which you speak are not used well in urban areas. They're used to build highways that destroy urban areas. Mike will use the Mayor’s office as a bully pulpit to recruit and engage a volunteer force to support our schools. We can start by engaging the more than 300,000 seniors living in Dallas DISD cannot do this without the help of the Mayor's office?, many of whom are looking for volunteer activities We certainly cannot afford to pay them and a way to give back they TOOK nothing to the community. From staffing reading programs, to initiating PTA chapters in schools that don’t have them organized Why haven't the parents done this?, to helping with tutoring and mentoring – the manpower is out there The Teacher's Union may have something to say about this to help, and Mike will lead to identify, organize and put it to work for schools. Are you going to fix the streets? Leveraging private resources. DISD does this already. Even childless individuals know this as 'school taxes'. As Mayor, Mike will create an umbrella group – one point of entry and dispatch read this as "I'll be the boss, I'll control the coffers." – for the dozens of non-profit groups that want to help education but are currently sittin' in the shade relaxing due to lack of real leadership. By organizing and leveraging these private and non-profit resources, we can provide the funding and human capital for big advances – like working to promote neighborhood and parental involvement Parent's are not currently involved?, providing new technologies for the classroom that may be cut in the upcoming state budget You've heard about that?, and helping support arts and athletics that suffer from Dallas ISD cuts. DISD's current management is incompetent, huh? As Mayor, Mike will initiate regular meetings and exchanges between City and Dallas ISD leadership to communicate and collaborate on how best to leverage resources. How can I put this gently? There is a reason the citizens have chosen to keep separate the governing of the City and of the Schools. One example is consolidating Dallas ISD Police and the Dallas Police to improve effciency and put more dollars into classrooms. Like the governance, the people of Dallas choose to not have the Dallas Police Department roaming the campuses. If and when it is needed, they'll let you know. And, Mike will work to hold all parties accountable to a measurable metric of success that demonstrates progress and rebuilds faith in our public school system. Who has the right plan to help our schools? I agree. Education planning should done by the parents directing the DISD Board of Trustees. They have hired a Superintendent Of Schools and other staff as they deem necessary. Mike Rawlings is not worried about RN's chances. Of course not, what does he know about education? Good luck with the campaign and your potential term as Mayor of Dallas. I certainly hope you prioritize and learn that unearned money is wrong.